A realistic replacer for the iron weapon meshes and textures with bump maps and reflection maps. Thanks to Psymoniser for his iron weapon meshes and to Daduke for his corrected miner's pick shadow. The miner's pick now displays a correctly shaped shadow when equipped instead of the standard axe shadow. 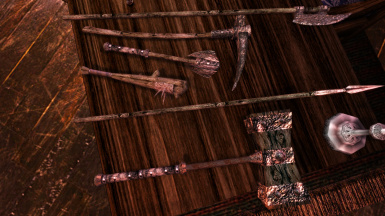 I copied the ShadowBox from Daduke's mod of the original miner's pick: http://www.nexusmods.com/morrowind/mods/1216/? 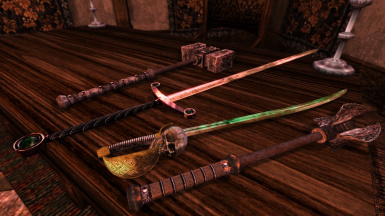 I made this mod because I wanted to have more realistic and detailed textures for the original Morrowind weapons, which still had a similar style as the original ones. 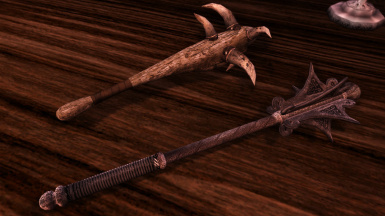 Darknut's weapon textures are probably the most widely used and a great improvement over the original ones, however I think they often make the weapons look like they are carved from stone, which is a result of the upscaling technique he used to make them. Also, since they are only upscaled versions of the originals, they don't have more actual details than those. So I decided to create completely new textures, some made from photos and many completely hand-painted, as well as add reflection and bump maps to the meshes where appropriate. This mod now covers the first weapon class: Iron. The meshes are derived from Psymoniser's Improved Iron Meshes, of which I have modified most more or less extensively. As I have changed the UV maps of most meshes and my new textures don't fit vanilla meshes or Psy's unmodified ones, I have placed them in a separate folder, so that no textures intended for the original meshes are overwritten, in case someone wants to use other meshes again. Almost all textures have been entirely made by me, either from photos or completely hand-painted from scratch. I have only adopted some wood textures from Morrowind Visual Pack. Thanks to the original creators! As mentioned above, the meshes are made by Psymoniser and were modified by me. There are also compatible meshes for Psymon's Iron Mesh Improvements: Uniques included. They can be installed separately, but require both the main files of this mod and the original mod by Psymoniser. To display bump maps correctly in the game, you need to install Morrowind Code Patch with the option "Bump/Reflection Map Local Lighting" checked! 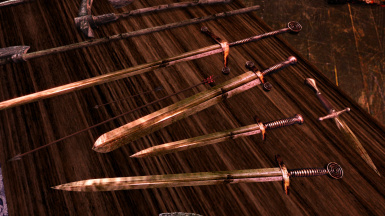 Without this, some of the weapons will look weird ingame. It is not recommended to use these meshes and textures without the Code Patch! v1.1 The miner's pick now displays a correctly shaped shadow when equipped instead of the standard axe shadow. 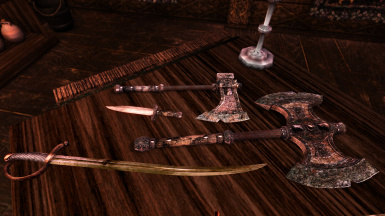 I copied the ShadowBox from Daduke's mod of the original miner's pick: http://www.nexusmods.com/morrowind/mods/1216/? v1.3 Small update to fix a glitch that would cause the reflection to disappear on some meshes when they were dropped. 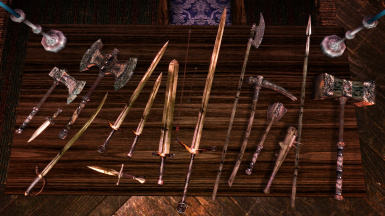 Special thanks to Psymoniser for creating of the improved weapon meshes as well as for making them available to be used and modified for other mods!